BJCI - APPUNTAMENTO!! DOMENICA 12 GIUGNO 2011, ORE 19:00 !! LIVE STREAMING FROM MUNICH !! APPUNTAMENTO!! DOMENICA 12 GIUGNO 2011, ORE 19:00 !! LIVE STREAMING FROM MUNICH !! You don’t want to miss out on this legendary performance so make sure to tune in Sunday, June 12th. Join us online at 19:00. The show starts at 19:45. 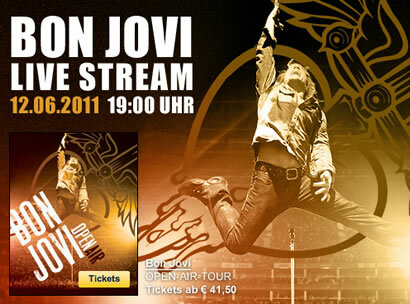 Bon Jovi takes over Munich, Germany on Sunday, June 12th at Olympic Stadium! Fans worldwide can tune in and watch the first 30 minutes of the show live in Europe!